There is convincing evidence that carefully applied classroom assessment can promote student learning and academic self-regulation. Such assessment includes, but is not limited to, conversations with students, diagnostic test items, and co-created rubrics used to guide feedback for students themselves and their peers. In this book, Heidi Andrade and Margaret Heritage, Senior Advisor at WestEd, write with the practical constraints of teaching in mind, presenting a concise resource to help pre- and in-service teachers maximize the positive impacts of classroom assessment on teaching. The authors translate work from leading experts and explain how to use assessment to improve learning by linking learning theory to formative assessment processes. 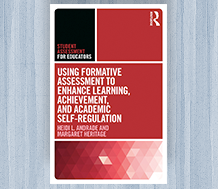 Visit the Using Formative Assessment to Enhance Learning, Achievement, and Academic Self-Regulation resource page to learn more and purchase your copy.